Sleek, minimalistic design makes this Trinsic Single-Handle Pull-Down Sprayer Kitchen Faucet in Arctic Stainless featuring MagnaTite Docking the perfect complement to today's modern home. MagnaTite docking keeps the kitchen pull-down spray wand firmly in place with a powerful integrated magnet, so it stays docked when not in use. Delta's exclusive DIAMOND Seal Technology uses a valve with a tough diamond coating to bring you a faucet built to last up to five million uses. Delta Innoflex PEX supply lines are included with DIAMOND Seal faucets, so everything you need is in one box. The design was inspired by the sleek elegance of modern European design. Delta ShieldSpray Technology cleans with laser-like precision while containing mess and splatter. A concentrated jet powers away stubborn messes while an innovative shield of water contains splatter and clears off the mess, so you can spend less time soaking, scrubbing and shirt swapping. Delta MagnaTite Docking uses a powerful integrated magnet to pull your faucet spray wand precisely into place and hold it there so it stays docked when not in use. Delta faucets with Diamond Seal Technology perform like new for life with a patented design which reduces leak points, is less hassle to install and lasts twice as long as the industry standard. A novel take on traditional poise, the Foundry kitchen collection provides free range of motion with a striking exposed hose, lending the design a pronounced sense of industry. Delta Shield Spray Technology cleans with laser-like precision while containing mess and splatter. A concentrated jet powers away stubborn messes while an innovative shield of water contains splatter and clears off the mess, so you can spend less time soaking, scrubbing and shirt swapping. Delta MagnaTite Docking uses a powerful integrated magnet to pull your faucet spray wand precisely into place and hold it there so it stays docked when not in use. Delta Spot Shield Technology helps to keep your faucet cleaner, longer by resisting water spots and fingerprints. Delta faucets with Diamond Seal Technology perform like new for life with a patented design which reduces leak points, is less hassle to install and lasts twice as long as the industry standard. Trinsic Single-Handle Pull-Down Sprayer Kitchen Faucet in Arctic Stainless Featuring MagnaTite Docking Sleek, minimalistic design makes this Trinsic Single-Handle Pull-Down Sprayer Kitchen Faucet in Arctic Stainless featuring MagnaTite Docking the perfect complement to today's modern home. MagnaTite docking keeps the kitchen pull-down spray wand firmly in place with a powerful integrated magnet, so it stays docked when not in use. Delta's exclusive DIAMOND Seal Technology uses a valve with a tough diamond coating to bring you a faucet built to last up to five million uses. Delta Innoflex PEX supply lines are included with DIAMOND Seal faucets, so everything you need is in one box. 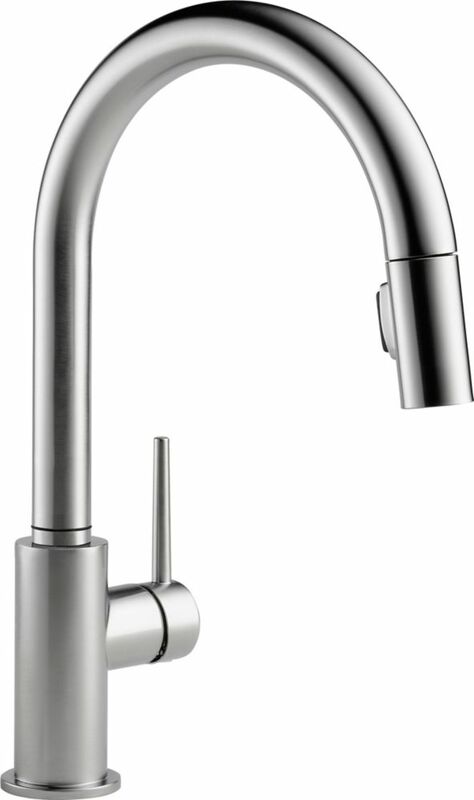 Trinsic Single-Handle Pull-Down Sprayer Kitchen Faucet in Arctic Stainless Featuring MagnaTite Docking is rated 4.3 out of 5 by 200. Rated 5 out of 5 by Patricia from Looks amazingly beautiful and functions great! Highly recommend this... Looks amazingly beautiful and functions great! Highly recommend this faucet! Rated 5 out of 5 by Gary from It looks better than I imagined from the photos. ... It looks better than I imagined from the photos. Sturdy, beautiful, and works perfectly. Precision aerated and spray settings. Magnetic latch for nozzle makes for effortless use. I'm really pleased with how handsome the chrome model looks in my kitchen. Installation instructions were good and all went well. (Given the awkward positions to be in under the sink, I recommend a pillow to lie on). We're very pleased with it! Rated 5 out of 5 by Mandl from This is a beautiful, perfectly crafted, modern-looking faucet: no fussy... This is a beautiful, perfectly crafted, modern-looking faucet: no fussy details, no dirt-trapping, spring-clad gooseneck. Very clean! A switch behind the spout toggles from stream to spray, staying that way ‘till you re-set it. The magnetic snap for the nozzle is crisp and efficient. Great product! Rated 5 out of 5 by Vicki from This faucet is exactly as pictured. ... This faucet is exactly as pictured.